to join just simply comment on her, what do you like about her? And also if u want then u can send some of her pictures by post so i can add them here for you. If u need any information on her then plz do not hesitate to ask. 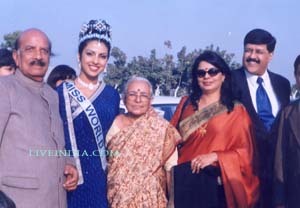 Chopra & Dr. Madhu Chopra, an event that transformed the life of every one around her. This first born girl child of a large extended family was welcomed like a star. With large twinkling eyes and the most fascinating smile she was a winner. in the peripheral areas of Bareilly. d. Joined the Indian Govt. sponsored Polio Eradication Programme as a volunteer. 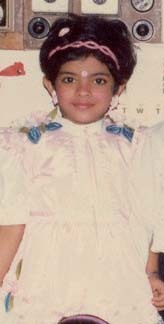 e. She raised funds for the destitutes at Boston USA by participating in their Church programme " Priyanka is a genuine, selfless, down to earth, warm and loving personality A very special person",. Father-Dr. Ashok Chopra is a doctor; he retired from the Army. He was a medical administrator at Lilavati Hospital in Mumbai until some time ago, but he gave it up because he wanted to go back to surgery. He is a surgeon now. Mother-Dr. Madhu Chopra-a gynocologist who practices at Kasturi Polyclinic, Andheri. Paternal Grandmother-Mrs Champa Wati Chopra and Late Sh. Kasturi Lal Chopra. Honour Choir Representative for Iowa's J.F.K. National Honour roll in New York '97 Opus Honour Choir Representative for Iowa's J.F.K. High School Topped school in English, Won prize for Extempore Speech and awards for singing and dancing. Happiest moment of your life, why ? I want to go sky diving before I'm 21. I've been bungee jumping!!! Lying on my Hammock under the moon lit sky with music and my teddy for want of something better. I know this is cliched but, winning the Miss World Crown has been the recurring dream for the past six years. Animal - A smiling cheetah because, I purr when I am stroked and growl when I am nasty. She's got all one could ever ask for, big banners and a mass fan following. The world at her feet after Bluffmaster and Krishh, and now Priyanka Chopra is looking forward to her latest movie Aap Ki Khatir, which is directed by Dharmesh Darshan. The movie is due to release on August 25, and Priyanka fans are in for a treat as her movie Aap ki Khatir marks a first-time pairing of Priyanka with Akshaye Khanna. The starlet has already had a good year and looks all set to continue on her wave of success. IamaPCmaniac	 15 6857 2012-12-02T12:45:26Z pluviophile.